It was a bitter, cold winter night when I first visited Tabla, but as soon as I entered I felt I had found refuge. The walls flashed bronze and gold; the host invited me to warm my hands at the heater by the door; the fragrant aromas of Indian spices filled the air. Sitting at the bar, waiting for my friends, I was asked if anyone was taking care of me. This is what Danny Meyer and Floyd Cardoz intended the restaurant to be, I think, but the realization was bitter-sweet. 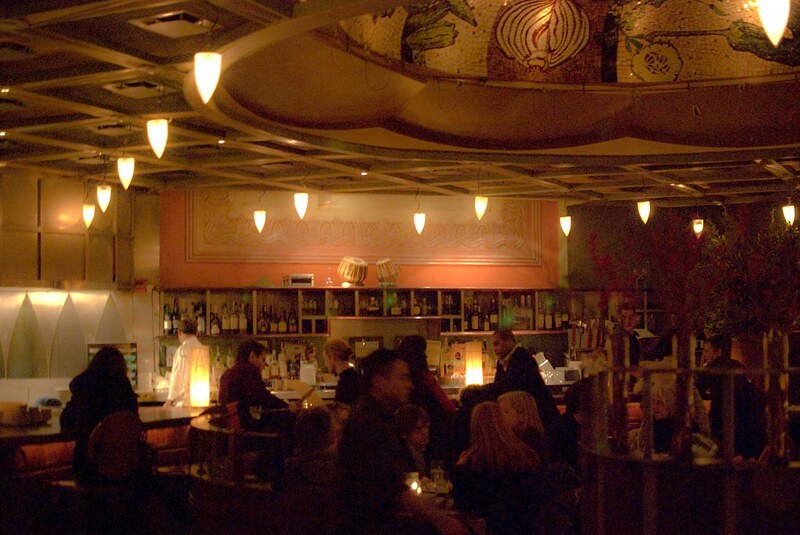 My first visit would also be my last; Tabla is scheduled to close on December 31st, 2010. In the spirit of the restaurant closing I had resolved to order a ton of food, and luckily my friends agreed to play along. We ordered a ton of appetizers to share. The Wild Mushroom Fricassée ($14) was elevated by the unexpected dose of coconut milk in the semolina polenta. The Roasted Phillips Farms Brussels Sprouts ($11) didn’t have a lot of the great brussels sprouts flavor that I love, but the toasted lentils gave great texture and flavor to the dish. Everyone’s favorite was the Paffenroth Farms Kale & Onion Pakoras ($9), of which we got two orders at the suggestion of our server so that we would have enough for all six of us. The crispy, chickpea battered pakoras were super flavorful, and I don’t know what “Boodie’s” ketchup is, but it made a great sauce for the deep fried dumplings. My entree was deceptively simple looking. The roasted broccoli & cauliflower ($19) perched on top of basmati-mung bean kichidi was tasty enough, but the dish kept revealing new levels of texture and flavor. 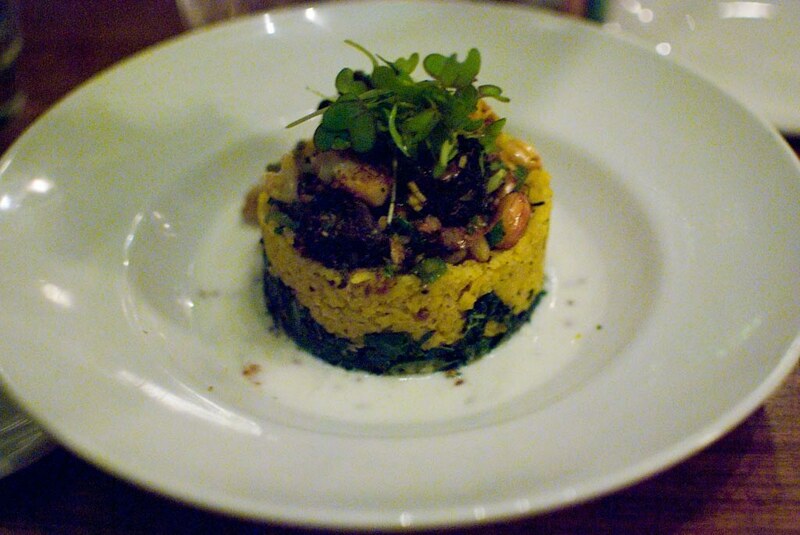 The rice was molded on top of cooked greens, which was sitting in a pool of spiced yogurt. The roasted peanuts that topped the tower added just the right amount of crunch to what would have been an all-soft dish. We also got several orders of flatbread — the first round that came out was kind of limp and lukewarm, but then we got a second order that was piping hot and poofed up beautifully. 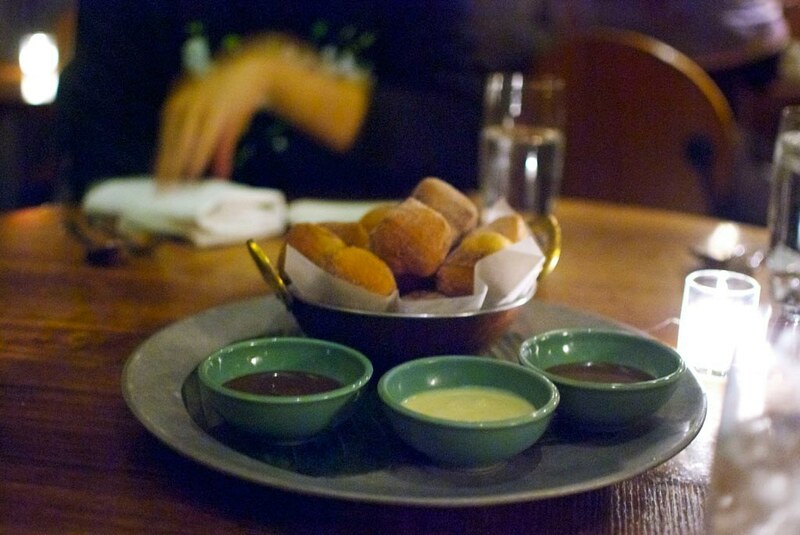 Although we were too full to get individual desserts, we got two orders of Tabla’s made-to-order Doughnut Holes ($10). They are served with three different sauces, chocolate, caramel, and something that I’m pretty sure was a vanilla bourbon sauce, which was my favorite. Nothing fancy here, or even recognizably Indian, just a rich, decadent dessert. As I’ve written before, expensive Indian food seems almost like an oxymoron. Tabla is certainly the most expensive Indian food I’ve ever paid for, but it was also the most refined Indian food I’ve ever eaten. Even better was the experience that I had. At one point I found myself thinking that our server was taking too long to come to take our order, but then it occurred to me that I was silly to complain about this; the long intervals gave us more time to spend together, talking and enjoying each other’s company. So to Jeff, Eva, Jess, Garrett, and Donny: thank you for helping me ring out 2010, and for helping celebrating one of NYC’s most interesting fine dining spots. 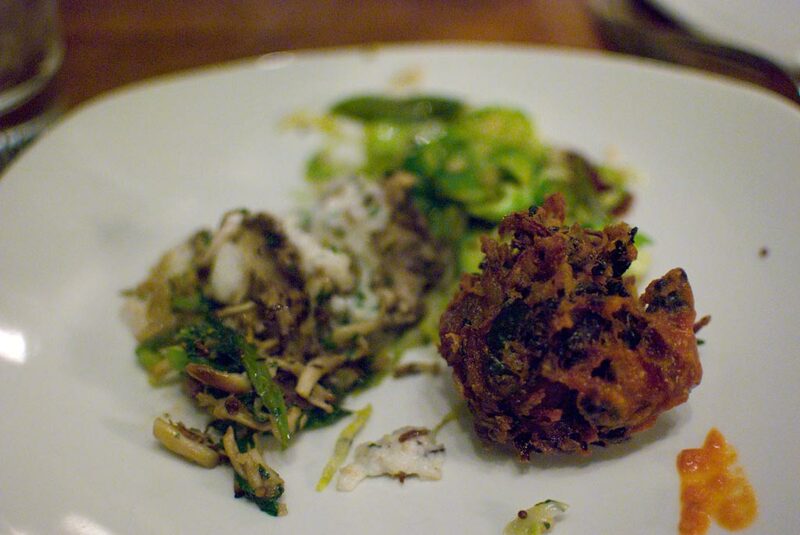 I know that in the future I will remember our dinner fondly, and that’s the real legacy of Tabla.